The drive to create harmony is exceptionally strong in Mars in Libra people. They derive great satisfaction from bridging divides, healing discord, and bringing people together. Due to their tact, diplomacy and exceptional interpersonal skills, these types make talented counsellors, negotiators, matchmakers and public relations workers. They devote much of their (somewhat limited) energy drive into cultivating friends and ‘significant others’, their ultimate quest being to find their perfect ‘other half’. In some cases they will tend to live out their own drives and passions through the activities of their partner. Mars in Libra types very much want to be well liked, and will go to great lengths to curry favor with people whose approval is important to them. They have a tendency to go over the top in their efforts to please others and gain their admiration, sometimes appearing disingenuous and insincere. The pursuit of aesthetic excellence is another big passion for Mars in Libra people, which manifests in their keen interest in artistic pursuits, interior design, fashion and beauty. Sexually, a strong intellectual connection is just as important as physical attraction, and their libido is often on the low side. Although many Mars in Libra individuals might describe themselves as pacifists, in reality they battle just as hard as anybody else for their objectives, using their highly developed people skills. Brilliant strategists who excel in predicting their opponent’s next move, these types are masters of the art of passive-aggression, resorting to subtly persuasive, psycho-manipulation rather than going obviously on the offensive. They shy away from, and rarely do well in, open confrontations, preferring to thrash out problems around the negotiating table rather than going to war. They become very angry when they see a situation that is clearly unfair or unjust and will fight hard to put it right, even to their own detriment. Mars in Libra types are actually much better at fighting for other people than they are for themselves. Normally quite indolent with rather low physical energy, when faced with a conflict situation in need of resolution, Mars in Libra people will work ceaselessly in their efforts to make the peace no matter how uncompromising or inflexible their adversary. Even when a relationship has finally ended, if at all possible they prefer to remain on friendly terms. Excellent people skills; talented counsellors, negotiators and peacemakers; fighters for justice; aesthetically gifted. Passive-aggressive manipulators; try too hard to please; disingenuous and insincere; fearful of confrontation; low energy drive and libido. People with Mars in Libra are sexually attracted to those with Venus in Libra, Gemini, Aquarius and Aries. This short report tells you about Mars in Libra - but would you like a more comprehensive personality profile for yourself or your partner? 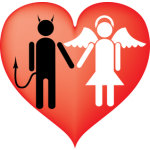 Why not try our insightful Cupid's Promise and Sympatico personalized in-depth reports?